Lindsay Lohan to appear on Duran Duran’s album! 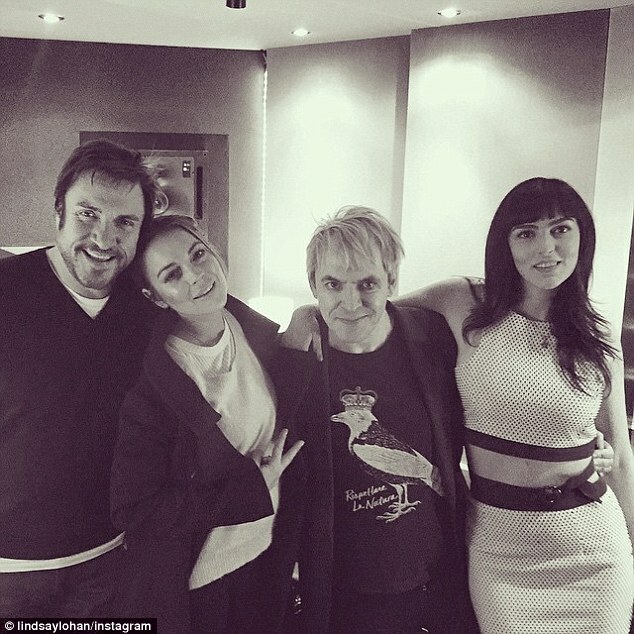 …she’s back in the recording studio, this time with Duran Duran! The last I heard about LL was that she had moved to England to escape TMZ and the likes of the crazy American press that follows her everywhere! I can’t say that I’d blame her because I know that I wouldn’t want cameras in my face all day, every day. A responsible life is one that Lindsay was hoping that London could give to her so we’ll see. She’s still in the entertainment industry, but we all know that she kind of blew it as far as her chances to be an A-list star go. She had it made in the shade with a lemonade, but drugs & alcohol took her down. It’s sad and makes me mad every time that I think about it, but at least she’s still doing something and maybe in a few years, she might get an outstanding role in a movie, resurface, and be respected by her peers again. Only time will tell. And on the far right is her sister Ali! Ali sang on the song however, Lindsay did not! Her contribution was spoken word which to me is very interesting and exciting! I can’t wait to hear the song!!! Duran Duran’s brand new album Paper Gods is going to come out on September 18th and also features Kiesza and Janelle Monae! Two great albums in my humble opinion 🙂 However, it’s been a long time since LiLo has gotten back to music! Even though it’s only spoken word, just the fact that she’s in a recording studio again makes me very excited for what’s up ahead! For Lindsay updates, follow her on Instagram (lindsaylohan), on Twitter (@lindsaylohan), and like her Facebook page (Lindsay Lohan). Good luck Lindsay on your career & let’s get a new album in the works! Keith Urban plays three festivals in 1 weekend!